The Nutcracker – it makes most think of snow falling as ballerinas scurry across the stage, Polichinelles running out from under Mother Ginger’s giant skirt, the Cavalier and Sugar Plum Fairy’s majestic pas de deux. Dancers likely also think of long rehearsals, performance jitters, tired bodies and a mix of many emotions. 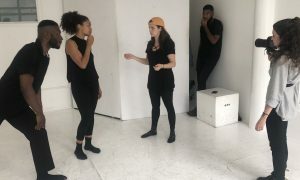 Many modern versions of The Nutcracker – from Jennifer Weber’s The Hip Hop Nutcracker to Mark Morris’ The Hard Nut to CONNetic Dance’s Nutcracker Suite & Spicy – mix up the classic with new movement, settings and design elements. Yet no rendition is quite as unique as this season’s The Nutcracker and the Four Realms film. Let’s take a look at the ways in which it’s truly unique, and why you should check it out! #1. Fully developed characters and a whole new plot, bring intriguing new life to a very familiar story. 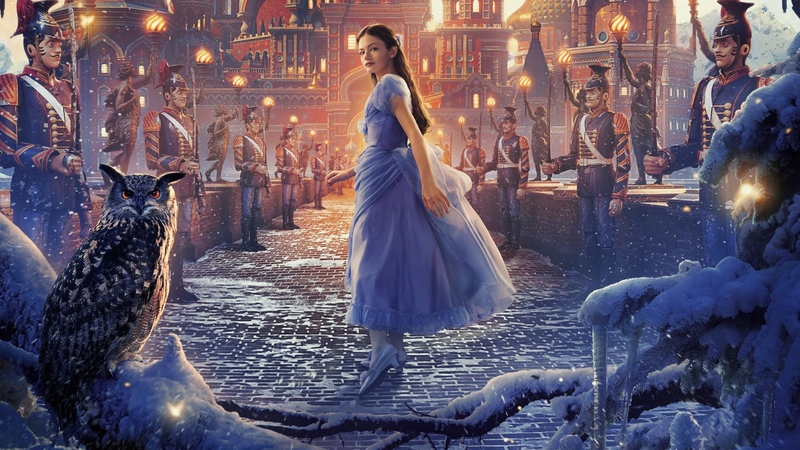 From the very beginning of the film, it’s clear that the characters will be more dynamic and multi-faceted than those whom we usually experience in traditional versions of The Nutcracker. Clara (Mackenzie Foy), her sister Louise (Ellie Bamber) and her brother Fritz (Tom Sweet), and their father (Matthew Macfayden) ride together in a carriage to a ball in a very early scene. We learn that Clara’s sister is obedient, Fritz not so much so, and Clara is very independent. It also soon becomes clear that Clara’s mother has passed away. This fact hangs as a heavy cloud over the family’s interactions, and even has a part in propelling the plot forward. Through this plot, we see Clara as a clever, strong spirit who seems – as a young woman – ahead of her time (the story set in the Victorian era). #2. Well-executed cinematography brings an artful, original perspective to the dancing. At that ball, to which the family was traveling, a panoramic overhead shot gives a wide view of the ballroom dance floor. There’s a cropping, however, as seen in impressionism – such as how Degas would cut out certain parts of the scene at hand. It feels more like how one might actually view such a scene with their own two eyes, rather than the main subject somehow being perfectly centered in the middle of the visual. The women, perfectly coiffed and with graceful white gloves, gracefully backbend as their male partners, in elegant cuff-linked suits, lean forward toward them. The pairs make lines as polished as the dancers each are. They then shift into a clean circle, the dignified carriage of the dancers mirroring the arches of the circle. The cinematography shifts to capture different parts of these lines and circles, just as one may see as their eyes scan a room from a natural curiosity about those in attendance. In some of shots, the camera moves closer. A later scene puts a theatrical ballet on stage, and similarly uses both panoramic and close-up shots to offer a naturalistic – yet also cinematically stylized – view of the dancing. In the ballet, the most notable quality of the dancing of Flowers and Snow is unison while in lines and arches – reminiscing synchronized swimming. Theatrical effects become a clever play on antiquated stage dressings – such as flat backdrops rising in succession by ropes, and flat wave-shaped pieces moving in alternating lines to create a wave effect. Camera angles again frame these shots in a way that feels like how we would view them in real life, yet also with an intriguing artistry that can keep viewers’ eyes fixed. #3. Various dance vocabularies come together to present a compelling diversity of movement. The ballroom scene is the first formal dancing we see in the film. The movement is poised, visually pleasing and full of ease. The ballet of the Four Realms comes next as a section of notable formal dancing, with pure classicism but also its own inventive touches. The credits then come with a lovely pas de deux. The two dancers move in and out of red and green spotlights, these colors underscoring the season. The effect of the colors bathing the white costumed-dancers, combined with intriguing camera angles, is spellbinding. Then comes a hip hop dancer – arguably unexpected in The Nutcracker. He shifts weight and alternates point and flex from foot to foot. His elbows initiate a snaking through his arms into his shoulders. This movement in a red light feels just as transfixing as the dancers dancing a pas de deux. The close juxtaposition of the contemporary and classical dance forms is also quite compelling. #4. Misty Copeland graces a couple of scenes with her powerful dancing presence, reflecting the commendably multi-racial cast. Yes, the Misty Copeland makes an appearance, and offers her unique artistry. She wears all white (even a white wig), which, with her smooth mocha-colored skin, is visually transfixing. Apart from her, there’s Morgan Freeman as Drosselmeyer. With Freeman’s sense of mystery, yet also warmth, this casting feels perfect. Jayden Fowora-Knight, also African American, plays the Nutcracker. He explains to Clara that he’s the only Nutcracker in the realm, and comes to be a protective figure for her. Yet how they meet, and their relationship throughout the story, feels different than in most Nutcracker versions. In all of the above, in a way that’s striking for a story set in the Victorian era, race seems irrelevant. These characters are just who they are, in a very refreshing way. #5. The film presents a whole new world, bringing us back to care-free childhood fantasies in a hectic time of year. 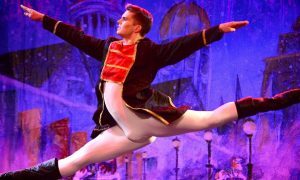 Traditional Nutcracker renditions reference the Land of the Sweets and in, some ways, the Snow section as their own “worlds”. 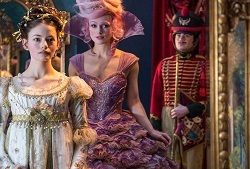 The Nutcracker and the Four Realms takes this to a new level. With indirect (yet purposeful) guidance from Drosselmeyer, Clara finds a whole new land of “Four Realms”, with a castle and a “Regent” for each realm. Sugar Plum Fairy (Kiera Knightley), Regent for the Land of the Sweets, explains how this land came to be – thanks to Clara’s deceased mother. There’s a whole backstory and life to this land of “Four Realms”. It’s all similar to the worlds we imagine as young children, when innocence and a lack of realistic adult understandings allow our imaginations to take us anywhere. During the holiday season, a highly stressful time for most people in modern culture, this escape into a new, imaginative world can be a truly rejuvenating respite; the two hours in a movie theater could be all we need to go back to it all with new energy, a smile and greater love in our hearts.